Part pirate wench, part romantic neo-Victorian explorer, our Evangeline blouse makes the perfect white canvas for your colorful ensemble. Express your individuality and dress this shirt up or down as you see fit; you certainly won’t be a soulless slave to fashion when your brassy bits and bling bring it to life. Fashioned from lightweight shirting, this blouse features ¾-length sleeves ending ruffles and lace. Satin ribbon detailing in front and in back is inspired from the corsets of the 19th century. The pleated V-neck and button-up placket are also trimmed in lace and a slight triangular scarf collar can be folded up or down depending on your mood. Fashioned from 97% cotton and 3% spandex. Imported. Machine wash cold and hang to dry or dry clean. Available in sizes XS - 3X. This has been a great buy for me. It goes with my pirate costumes as well as my steampunk costumes. The fit is great and since there is some elastic in the cuff of he sleeves I can move them easier than on a traditional shirt. I received the blouse and tried it on and it fit. The sleeves were a little snug but I can move the buttons enough to make it comfortable. After adjusting all the ties it worked just right. I'm pleased, as always, with my purchase and will be purchasing again soon. I've been drooling over this blouse for two years! I finally have a reason to buy it, and when I put it on, I felt lovely! I looked in the mirror after putting it on, and couldn't help but think, "Ooh la la!" In the future, I would love to purchase the cream/off-white, and black blouses! This style is very feminine! This site has a wide variety of Victorian, Edwardian, Western, and Steampunk clothing! It is pricey, but worth it! After all, the best type of costumes feel just like clothes ('cause they're likely to be actual clothing)! I loved the way this looked and felt - but I got a big size and it surprisingly fit pretty snugly. The front came down a bit low for me which was a little va-va-voom that I wasn't crazy about. I would have sewn it up if I had had more time. Overall - great look. LOVE LOVE LOVE this blouse! I have it in 3 colors to match my homemade bustle skirts!! Black red and now white! Yay! I LOVE these tops even though the "corset" parts are tied together with ribbon. I hate that stuff. I replace it with crafty cord. The ribbons just don't do it for me. The cord is a lot more sturdy to me. I've also purchased work blouses and I love them as well. They fit well and are sturdy! I can't wait to make some mercantile skirts and I will be the storekeeper's wife by day and the saloon girl slinging whiskey and beer by night! So glad to be retiring so I can spend my days cooking, sewing and running the general store! 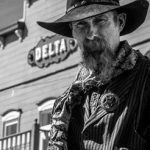 Looking forward to building an old West movie set where I'll run the general store, serve old fashioned home cooked meals and then the saloon! SO EXCITED!! I will be back to buy MORE!!! I have never been a fan of online clothes shopping until now. This blouse is stunning! The lacing made it easy to customize the fit in a matter of minutes. It created a bustle effect in the back that paired well with the Fitted Victorian Skirt that I wore with it. I am 5'-3" and found it to be lower cut that expected, but it worked! I would think that it would be less revealing on someone a little taller. I couldn't be happier with my purchases from Steampunk Emporium. After exchange (which went very well, I was impressed) larger size still tight but guess that is just the way it is with endowed persons. I love this shirt! Though fitted it is comfortable and moves rather than constricts! So versatile! I could wear this with full Victorian, Goth, or Steam Punk gear as well as jeans and boots! This shirt will be a key piece in my wardrobe! The delivery time was amazing! Such a pretty blouse: I bought a medium and it fits well - the lacing is a great help in customizing the shirt as I want to wear it. I want to try aging it in tea but plan to test a portion of the blouse and the ribbon lacing first to see how they both handle the dye process. The front is low cut but I didn't find it to be too low cut. I Would definitely buy another one. theatre is some of the most stressful work on the planet. when our ONE evangeline blouse did not come back from the cleaners in perfect shape, i panicked. i am in charge of wardrobe at our theatre and our stars must look perfect. when i called your company to get an IMMEDIATE back-up blouse, it seemed woefully impossible. but enter NOEL!!! our hero--the man who saved our show!!! he not only looked up the designers info so that i could make sure of ordering the same size, etc, he HAND WALKED my order out to blouse land in order for it to be shipped right away. what a guy! he was efficient, thoughtful, kind and UNDERSTANDING of my difficult situation. face it, blouses are everywhere--we could have gotten a second blouse from anyone. noel made it possible for us to have THE IDENTICAL blouse as back-up--keeping our designer, our actress, and no doubt, the world at large--oh so satisfied!!!! give him a raise PLEASE--employees like noel keep your business coming, and send him on some long wonderful cruise, a shopping spree--SOMETHING to show your appreciation. sincerely!!!! The ribbon detailing is beautiful and it fits perfectly. Its a tiny bit low cut, which I don't mind, but some might! Exceptionally pleased with the quality of the merchandise and the speed of delivery! I bought this blouse as a gift for my wife on Valentines Day. She wore it to church and had women gathered around her to admire the very feminine garment. Better yet, I acheived a new level of respect from the ladies for my good taste. It's a winner. Items are very good quality and received them in timely matter. Fun site to shop on!